In this post, I have described the working of a Chamatkari or magical and fast working Vashikaran Mantra Chant that is said to work by chanting it just one time, while remembering the name of the desired man or woman and visualizing upon a mental picture of that person. The best thing about this Siddh Akarshan Spell, which is called as Naam Aur Smaran Se Vashikaran Karne Ka Mantra is that it does not need any kind of object, like photo, food or eatable, supari, clothes, hair or any other object. The Vashikaran Mantra appears in an authentic Vashikaran Tantra, However, as mentioned time and again we can only show the way for the seekers of Vashikaran Mantras and Tantras by giving you the best rare and authentic Vashikaran, Mohini and other enchantment. However, ultimately gaining success in these enchantment spells, ultimately depends a lot upon the self-confidence and will-power with which the practitioner casts these voodoo spells. The Vashikaran Mantra is given below, the practitioner has to visualize the desired person in his or her mind and then chant the Vashikaran Mantra just 1 time with firm concentration. That is all that is needed in order to practice this Vashikaran Mantra, which is a self-operating Mantra Chant that is independent of any rules, like Shubh Muhurat, Disha, Aasan and Puja-Vidhi. 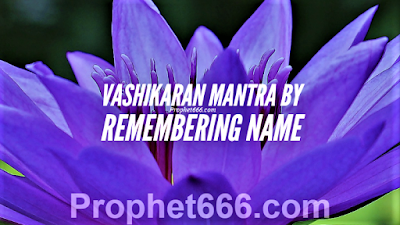 Notes- This Vashikaran Mantra should never be used for fun or just to see what happens by practicing it on an unknown person or a celebrate. It is essential that the desired person should be known to the practitioner. Mantra rare and authentic Attraction Spell and Charms can be seen in the sections on- Attraction Mantras and Spells, Vashikaran Tone Totke and Upay and Vashikaran Yantras. Hello, in the video she says "mahavide" and not "mahavidye". Is that correct? because its written met een "y" in it. Wich one is correct? Thank you. It is Vidye when typed in Hindi as विद्ये, the pronunciation in the video is correct.